Food forms a critical part of our life not just from the point of view of mere survival. From a scientific point of view, the quality and composition of food we partake is very important as it supplies all the nutrition that our human body needs for sustaining itself and discharging the various activities on a continuous basis. This apart, even from a spiritual point of view, food plays a very significant role as the essence of the food we partake, constitutes the mind and therefore the consequent thoughts and feelings that arise there from. It is said, “As is the Food, so is the Mind”. Bhagawan Baba has spoken extensively about the role of food in our life. He defines food as not just the edible items we eat through our mouth; but all the inputs we receive through all our sense organs. Therefore, what we see, what we hear, what we smell, what we feel, and what we eat – all these collectively constitute our food. However, this posting that will appear in four parts, are all related to the edible food that we partake of, using our mouth and tongue. To present all facts and details that Bhagawan has mentioned in various Discourses about the What, Why and How of eating food; the contents have been logically categorized into four parts. Part-I deals with the purity of food and its impact on the mind. Part-II discusses the process of offering food to God before partaking of it and avoiding distractions while eating food. Part-III focuses on moderation in eating habits and very significant dietary tips. Finally, Part-IV touches upon the harmful effects of eating non-vegetarian food and of consumption of alcohol (specifically from a spiritual point of view). Part-II deals with the process of offering food to God before eating. This transforms the food into Prasaadam, thus removing all the defects from the food. It elaborates on the ill effects of watching television or discussing inappropriate topics while eating food. 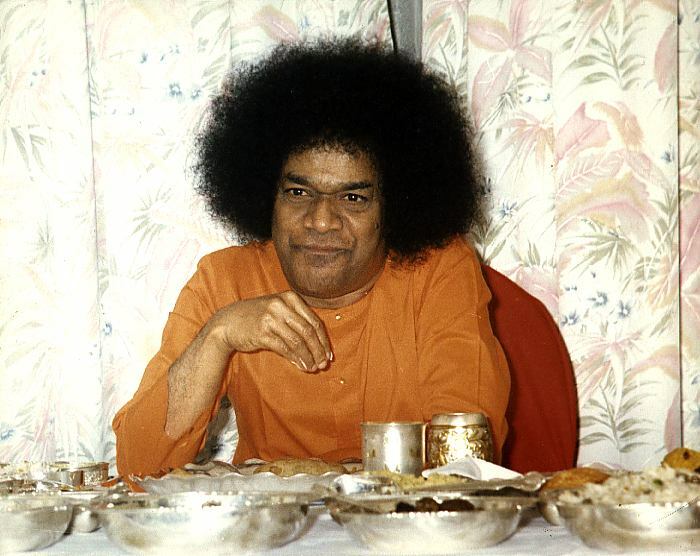 There are 7 excerpts from Bhagawan’s Discourses on offering food to God and the code of conduct to be followed while consuming our food; presented in this posting. These excerpts have been selected from Discourses given by Bhagawan Baba in the years 1993, 1994, 1996, 2001, 2002 and 2003. In Clip-1, Bhagawan explains about the three types of defects that can get into the food we eat. These are Paatra Shuddhi (defect related to the vessel used for cooking); Paaka Shuddhi (defect related to the process of cooking); and Padaartha Shuddhi (defect related to the materials used for cooking). Bhagawan also offers the solution of chanting the Bhagawad Gita sloka –“Brahmaarpanam...” as a means to purify the food that we eat. In Clip-2, Bhagawan illustrates the importance of chanting the prayer before eating our food and thus offering our food to God, by narrating the story of a Sanyasi in Hrishikesh and how his mental state was deeply affected on account of the type of food he had consumed. Clip-3 explains the meaning of the Bhagavad Gita sloka – “Brahmaarpanam...” - that we chant before eating food. 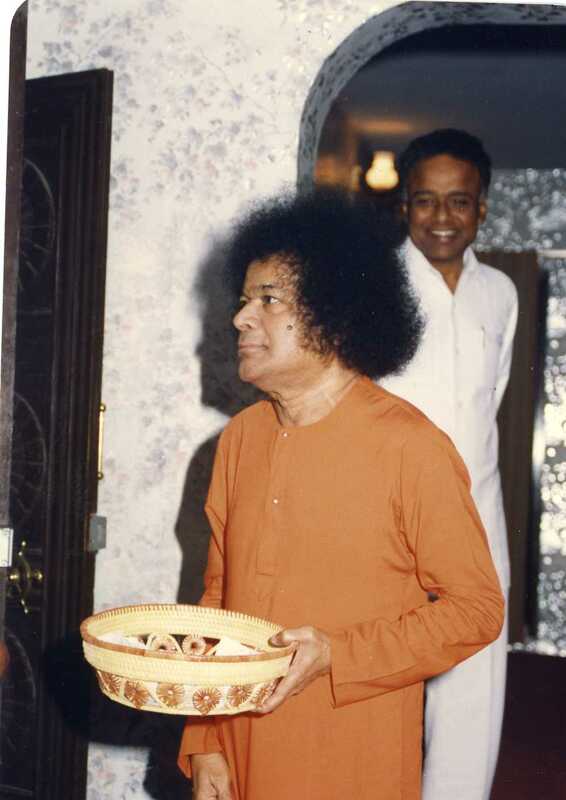 In Clip-4, Bhagawan instructs His students to inspire and appeal to their parents also, to begin the parctice of chanting this prayer before eating their food. Clip-5 is a description of the modern age life style wherein parents encourage their chidren to sit in front of the television and eat their food while watching the television. 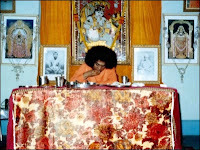 Bhagawan explains the harmful effects of eating food in this manner. In Clip-6, He further elaborates on this issue of how one should conduct oneself while eating food. Finally in Clip-7, Bhagawan once again appeals to all, to give up the practice of watching television whle eating food. Our students know this very well. Before eating food, we offer the food to God – Brahmaarpanam Brahmahavir. Why should we offer the food to God? There are three types of defects that are associated with the food items: Paatra Shuddhi (purity of the vessel in which the food is cooked), Paaka Shuddhi (purity of the process of cooking) and Padhaartha Shuddhi (purity of the materials used for cooking). When all these three are pure, the mind will also be pure. When these three are not pure, impure feelings will arise in us. So first is Paatra Shuddhi – to some extent we may be able to take care of this aspect; but Padhaartha Shuddhi – purity of the materials; how do we take care of this? What you may have bought from which shop? How would the shopkeeper himself have bought these materials? From whom would he have bought the vegetables? It is not possible to look into all these details. Thus it is not always possible to ensure the purity of the materials used for cooking. Next is Paaka Shuddhi – how do we know what feelings the cook may entertain while cooking the food? If he cooks the food with bad feelings, these bad feelings will get into the cooked food too. Therefore, as it is not possible to ensure the three forms of purity: Paatra Shuddhi, Paaka Shuddhi and Padhaartha Shuddhi; it is essential on our part to offer food to God in the form of a prayer – Brahmaarpanam. Once the food is offered to God with this prayer, it gets sanctified. Then it is no more food, but it gets transformed into Prasaadam. But then, what is the reason within, which sanctifies the food? “Sir, the food that you send within while eating, is digested by me in the form of ‘Vaishvaanara’ in the digestive system”. 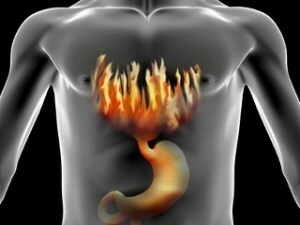 Since God exists in the form of Vaishvaanara (digestive fire), and digests the food Himself, it gets purified. If we do not offer this prayer before sending the food into the digestive fire in our stomach, it would amount to throwing some item in the fire and it will get extinguished. We must offer the prayer with full faith that God is present in our stomach in the form of Vaishvaanara. Embodiments of Love! Even if it may take some more time, have your food only after praying and offering it to God. Only then the food will become sanctified and will illumine your intellect. Once upon a time there was a hermitage near Sivananda’s Ashram in Hrishikesh. There lived a number of celibates over there and free Chapatis (food) were distributed to all. The residents of the hermitage also partook of the same food. In that hermitage, there lived a sacred and noble Sanyasi (recluse). One day a businessman donated money to prepare food for the ashramites on the eleventh day after the demise of his young wife. However, this food turned out to be poisonous. What was the poison? How did the young girl (wife of the businessman) die? The businessman was aged. However, being rich, he somehow had enticed the girl’s father with money and married his young daughter. The young girl spent her time languishing that her father had destroyed her life in this manner. Disgusted by leading such a life, one day she jumped into the Ganges and ended her life. The businessman was performing the obituary rites on the eleventh day. He distributed the food so prepared, to all close by ashrams. There was a convention in the ashram that cooked food was not accepted. However, one could pay the necessary amount for the purchase of materials, so that the ashram residents could cook their own food and partake of it. So, the businessman gave the required amount of money for preparing the food. The food was prepared and all partook of the same. The pure-hearted Sanyasi also partook of the food along with other residents of the ashram. He could not get proper sleep that night. He felt very miserable. He could visualize a young girl in his dream. He thought to himself, “I never had any such thought nor do I have a craving for sensual pleasures. Then, why do I get such bad dreams?” He got the same vision even in his meditation. He felt very miserable that he got such thoughts and dreams. So the next day, he went to his Guru by name Satchidanandam and explained his predicament, “Swami, why am I getting such unsacred visions?” The Guru told him not to worry and that he would enquire into the matter. Next day, he sent word for the businessman’s family; spoke to them and found out the reason behind performing the obituary rites on the eleventh day. He discovered that the young girl (wife of the businessman) had committed suicide. Nobody knew the exact details of how she went about committing suicide but they were performing the obituary rites for the same. Satchidanandam called his disciple the next day and explained to him that this young girl had committed suicide in this manner, and her languishing soul was appearing in the dream of the Sanyasi because he had partaken of the food prepared as part of her obituary rites. Therefore, impure feelings can lead to such impure visions. From that day, the Sanyasi stopped eating such food and lived merely on fruits and milk. Bhikshaannam Deharakshaartham - food is essential to sustain the body. A car needs petrol to run. In the same way, any body; even the body of a Sadhaka (spiritual aspirant) requires the petrol of food to run (sustain itself). So, one has to eat something or the other to sustain the body. Thereafter, the Sanyasi did not get any such visions. 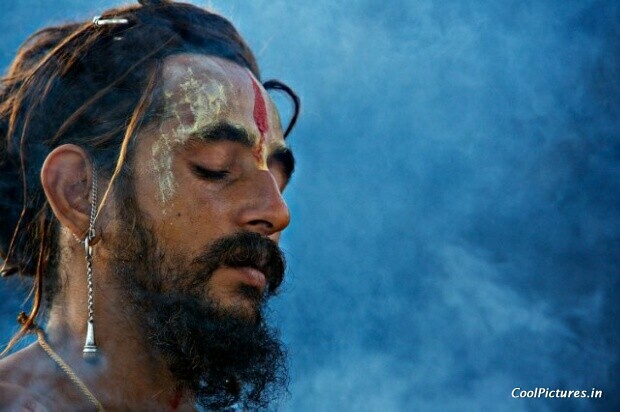 Sometimes, people get bad dreams in sleep and bad visions during meditation. This is the result of food. The food and the one who provides the food are responsible for these defects. That is why in ancient days, people followed the principle of Svayam Paakam (cooking food oneself). When you go to the market, you must find out from where the vegetables have been sourced. Have they been stolen or have they been accepted as bribe? We must consume only that food which is free from such defects. But, at the same time, it is difficult to investigate into such defects. This is the prayer you all chant in the College before eating. If you pray with sacred feelings, the food gets sanctified. Whatever defects one may commit, it will not have any impact on you. The food is Brahman, the process of offering it is Brahman, it is being offered to the fire of Brahman. He who thus sees Brahman in action, alone reaches Brahman. 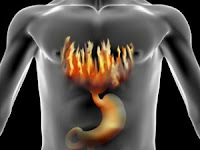 I am the fire of digestion in the stomach of all living entities, and I join with the air of life, incoming and outgoing, to digest the four types of food (solid, liquid, semifluid, and fluid) which they eat. God replies “My dear one, I am in your stomach in the form of Vaishvaanara. Why do you worry? I receive and digest the four types of food that you partake of. You don't need to send any special invitation to Me nor extol Me. You do not need to specially invite Me. You do not need to give Me any interview! You do not need to utter any words at all! I am yours and you are Mine. I am with you, in you, above you, below you, around you.” God has given you such a great promise that He will be always with you. But you are not able to understand this. When you pray, “Brahmaarpanam, Brahmahavir...” before eating your food, parents too will watch you and think, ‘Wow! See how much devotion he has”. Then you must tell your parents, ‘Mother, the food that is gifted to us by God, must be offered to God first and then we must consume the same. Once we offer the food to God, it no longer remains as food. It gets transformed into Prasaadam. There will no defects in the Prasaadam. Once you tell your parents like this, they too will get the desire and will start chanting the prayer. This, if we wish to bring about a change in the parents, we can do so through their very children. Some foolish students consider this practice of chanting the prayer before consuming food in the Hostel, as a forced discipline. Such students chant the prayer so long as they are in the Hostel. Once they go home, they do not chant any prayer. They eat food with useless thoughts and lead a meaningless life. And do you know how the process of dining takes place these days? Parents feel that their children have been living for one long year in Puttaparthi, Bangalore or Anantapur (in Swami’s college) and they have been deprived of the opportunity of watching any TV or video. Thinking so, when their children come home, parents say, “Oh! My dear child, please watch the TV”; saying so they lay the table before the TV, they serve the food over there and the children even eat their food watching the television. As they watch TV and consume their food watching (the actors’) feelings on TV, the same thoughts come into the minds of these children too. This is one of the primary reasons for children getting spoilt during the holidays, as they do not offer the food that they eat to God. Sitting on the dining table, they fight with each other. Thus Saankhya philosophy stresses on the need for purity in the food that one consumes. While eating our food everyday, we should not indulge in discussion of topics which will cause agitation, sorrow, or anger. It is essential to partake our food with a serene and peaceful mind, with sacred feelings, and with Divine thoughts. Mental tension is responsible for ill health. These days, in the modern age, we engage in some perverted acts while eating. We tend to watch TV, video, etc., while eating food. This leads to impurity in the mind. We must make every effort to prevent our minds from becoming impure. Even while eating food, the T.V. is kept in front, in the Dining Hall. People watch T.V. even while partaking their food. The result is that, not just the food, but even all the foul things seen on the T.V. are being consumed by the viewer. Full concentration is only on the T.V. This concentration in viewing T.V. (Drushti) affects one's view of the world (Srushti). The scenes, thoughts and actions displayed on the T.V. give rise to similar thoughts and feelings and actions in the viewer. Unknowingly, agitations and ill feelings enter the minds. One starts wondering as to why such thoughts and feelings that were never there in her/him before, have started appearing now. All these thoughts and feelings arise because of the seed sown while watching television. In due course the seeds take root and sprout in the minds. Hence while taking food; we should not discuss dreadful incidents. No room should be given to topics that excite the mind. We should not argue with each other while eating. Silence should prevail during eating. Even sound waves enter into our hearts and affect our minds. Based on the sound waves that enter into us, thoughts too arise in our minds. Hence we should take care that such vibrations do not enter into us. 01-What are the three types of purities that one must ensure in the food that we are to eat? 02-What is the message that we get to learn from the story of the Sanyasi in Hrishikesh that Swami narrates to us? 03-What is the meaning of the sloka, “Brahmaarpanam, Brahmahavir...” that we are supposed to chant before consuming our food? What is the source of this sloka? 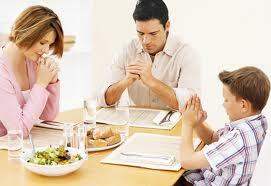 04-How can children inspire their parents to chant the food prayer before eating food? 05-What are the harmful effects of watching television while eating our food? 06-Apart from not watching television while eating our food, what are the other codes of conduct that Bhagawan lays down that needs to be followed while eating our food? Now we are aware of the necessity for purity in the food that we eat. We know the impact that impure food can have on our mind. Bhagawan has already given us the solution to ensure purity and sacredness of the food that we partake. He has also taught us “how” to eat our food. In the next post, we will listen to Bhagawan talking about “how much” food to eat. Tips on moderation in food habits and other dietary tips constitute Part-III of this posting.